my boyfriend's birthday is coming up, and this year i decided to get him a Comme des Garcons wallet. surprisingly, this is somewhat of a challenging purchase. i didn't want to get him something plain and boring like your typical brown leather billfold (though there are plenty of attractive options from Mulberry and others). it's challenging because, for those of you familiar with CdG wallets, their signature design is the zip-around style. so when i was looking online, i came across this cobalt blue version from CdG's new 'Luxury Group' collection. this is where it gets tricky, though. depends on him, i guess? i can see how the zipper would read as feminine. i'm not sure i would get it for my husband, but that's because he prefers the ease of a billfold. i love the cobalt color, but you're right, the zipper could read as more feminine. what's your dude's style like? if it's more traditional or low key, i'd go with a classic billfold. i sort of agree... the zipper is that "one extra thing" that gals like but guys might find fussy. however, CDG makes the best wallets, bar none. i love my zip around so much. Im a "guy" (even though i prefer to pronunce my gender as boy..) and i really like that wallet. But! The only feminine thing about the zipper is the color, i think. Have you considered the snake print one, with silver hardware? Amazing blog youve got. Thank you for that! I agree with Kristian that the 'femininity' probably comes with the treatment of the zipper hardware rather than the presence of a zipper (though, yes, the presence of a zipper does up the femininity--but it's not something that can't be counter balanced with masculine hardware treatment). For example, this wallet would be more masculine if the zipper were more of a rusty bronze or oxidized silver--the gold is a little more . The little leather 'tag' on the zipper is also a bit more feminine than what I would buy for my boyfriend. Finally, what is the zipper pull itself like? I feel like a more substantial zipper pull with harder edges is more masculine than a rounded zipper pull that is very delicate and light. 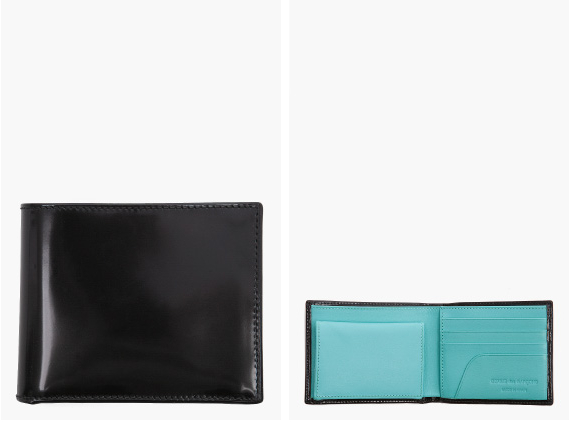 Finally, have you tried to looking at the wallet in a traditionally masculine color like brown or black? The cobalt blue is very unusual for a men's wallet and that + zipper might read more feminine than black + zipper. Hope you can find an appropriate gift and I'm sure that he'll love the gift no matter what it is! wow, I'd love the wallet for myself, lol. But I know my husband would never go for it. He's more of a wilderness man kind of guy however, so has simple tastes. I really think it depends on the guy. I don't find it particularly feminine looking but very designer-y, if that makes sense. everyone: i'd also really like to hear Rei Kawakubo's take on this. lol. joyce: i agree - CdG wallets are one of the few things that is worth paying full retail. given how i've thrown mine around and used it thousands and thousands of times at this point, it's proven to be indestructable and brilliantly ergonomic. I think the zipper is a bit feminine, too. I like Billykirk wallets for men, the kind that are like thin, flapped pouches rather than billfolds. Makr makes a similar option, but they tend to emboss their name a bit prominently. I'd say forget gender unless he minds it himself, but from your description of his style I think he'd like the zipper detail. The question is more of if you think he is a slob and prefer not to deal with the zipper. If he's someone who selects what he carries and wear more by functional issues rather than aesthetic then the zipper may become the obstacle and he may end up not using it as you would want him to. But, well, love triumphs, no? I'm sure if it's from you he'd be one happy man using this amazing wallet. V: hmmm...i think it's just bothered me a bit that my bf's wallet has always been a bit overstuffed and messy. i don't think the single flap pouch wallets are functional enough to keep everything organized and in place. though the idea is appealing! mr: thank you for the links! i'll have to check them out. i mean i knew this already but i still find it kind of interesting that a zippered wallet strikes the majority of the commenters here as feminine! :P i wonder if this is something where it's more conservative in the US versus elsewhere in Europe or Asia? love the blog. i love the wallet selection, but more for a girl than a guy. my husband agrees. check out this company...maxx & unicorn. my husband bought his wallet from them, and he loves it. after our dog chewed the first one, he bought his second one which is now worn in and looking quite nice. I think if anything is making the wallet "feminine" it would be the color. But it's really not a big deal, it is only a wallet. I have a men's wallet that zips around, but it is black with silver hardware. I don't like zippered wallets in general, and the last one I had I left it almost permanently unzipped - but I'm lazy like that. It depends on whether you think the zip would bother him. As for the colour, no guy I know will carry a wallet like that but if you think your bf is open to it, by all means go for it. I actually like the beige in the same luxury grp series, it's not the usual black and dark brown for men. I don't find the zipper feminine at all. I understand you wanting to avoid brown and black, and this colour is great! i reckon the colour firstly then the zipper make it slightly more feminine in vibe. that said, that blue is lovely and unusual. think the zipper might be the bigger hurdle in that would he find it finicky? also how does your man store his wallet though, as the size looks like it might be a bit large for pockets? i love your choice. that aqua lining is amazing. i like your choice better than the zip one! i love the zip one, but it's a bit bulky and if he prefers to put his wallet in his pocket it won't work so well. I think you plumped for the right one! Practical yet unpredictable!